Trinamul MP Abhishek Banerjee launched a broadside against the Gorkha Janmukti Morcha, saying Bimal Gurung and Roshan Giri were moving around with "56-inch tongues" and indulged in "politics of lies". Mamata Banerjee's nephew invoked Prime Minister Narendra Modi's "56-inch chest" remark to castigate the Morcha at a rally organised by Trinamul at Motor Stand here for the May 14 municipal polls. "The BJP talks about a 56-inch chest and here in Darjeeling, Bimal Gurung and Roshan Giri move around with a 56-inch tongue. They have only indulged in jhoot ki rajiniti (politics of lies)," he said. "Darjeeling is close to my heart. Seven municipalities in Bengal will go to elections but I am addressing my first meeting here. Our leader, Mamata Banerjee, has visited Darjeeling and north Bengal around 65-70 times in the past six years and it is because we love the hills," Banerjee said. "We do not lie but we have people here who talk big and raise big slogans. Every word is a lie. They have misled the people and they only want power and chair. There has been no development here, there is no water, no electricity, they can only indulge in lies," said Banerjee. The Trinamul Youth Congress president said the party did not believe in politics of lies. "We do not believe in lies. We have fulfilled all our promises. Mamata developed Lamahatta, set up an ITI college in Mungpoo and the state government has formed 15 cultural development boards. We have provided Rs 15 crore for waste management to Darjeeling municipality, Rs 4 crore for street lights, Rs 12-13 crore to solve water problem but nothing has been done." Challenging Gurung, Mamata's nephew said: "If my claims are wrong, then I challenge Gurung to file a case, if you are a man. A man does not become a man and a leader by terrorising but by working for the common people." Roshan Giri, the general secretary of the Morcha, sought to refute Banerjee's claim. "The Rohini Road was repaired in two phases at a cost of Rs 24 crore and where has the Rs 100 crore figure come from. The Darjeeling municipality has received Rs 195 crore for water distribution. But since there have been no takers for tenders, the funds are lying in the treasury. All roads in Darjeeling have been properly repaired. Tender for the Rs 4 crore street light project was called during the present SDO's tenure as administrator." Giri said the Morcha would hold a meeting at the same spot on May 11. Addressing the Trinamul crowd, state minister of information and culture Indranil Sen said: "For Darjeeling, I have brought 32 steel trunks of 6ft length and ropes. Now, it is your job, brothers and sisters. The elections are slated for May 14 and cast your votes for TMC and GNLF and pack Bimal Gurung, Roshan Giri and all their candidates and send them to another district. At that time, you will hear them sing Kabhi Alvida Na Kahna (Never say goodbye)." There are 32 wards in Darjeeling municipality. Binay Tamang, the assistant secretary of the Morcha, condemned Sen's speech. "This is our land and who is he to say we should be packed in a steel boxes and sent away from our land. We condemn the statement from a minister. 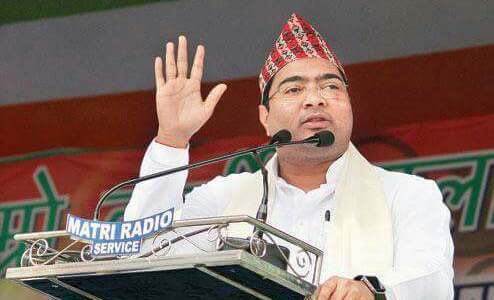 If any untoward incident takes place because of this statement, Indranil must be held responsible," said Tamang.